India's cultural and geographical wealth reveals itself to you when visiting the many UNESCO World Heritage Sites. The Taj Mahal, Amber Fort and the Palace of Winds in Jaipur as well as the lakes in the city of Udaipur are some of the most attractive sights of the country. The cultural legacies of ancient dynasties meet you both in India's north and in the south of the country. 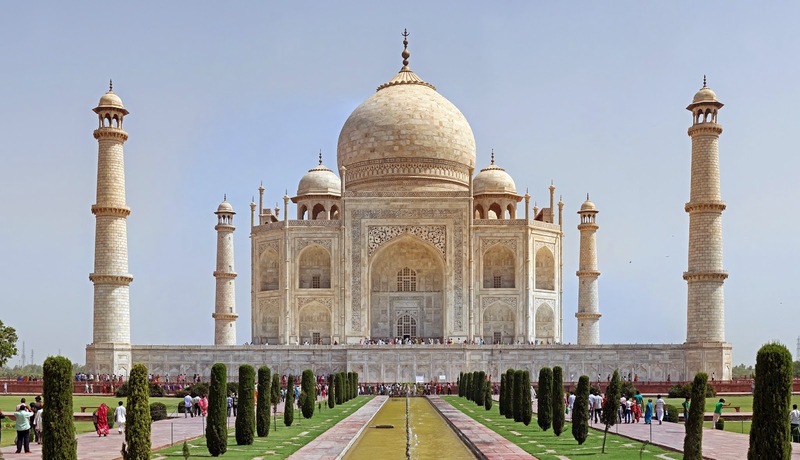 The Taj Mahal is like the old imperial city of Fatehpur Sikri as a World Heritage Site by UNESCO. With the Taj Mahal visit one of the most important buildings in Indo-Islamic architecture. About 40 kilometers west of the world famous mausoleum is located at Fatehpur Sikri, the ancient capital of the Mughal Empire with a valuable treasure of architectural monuments. The perfect combination of heritage and unparalleled natural beauty, while visiting the city of Udaipur. With its magnificent island palaces and temples of the place in northwest India is a tourist attraction for visitors from all over the world. 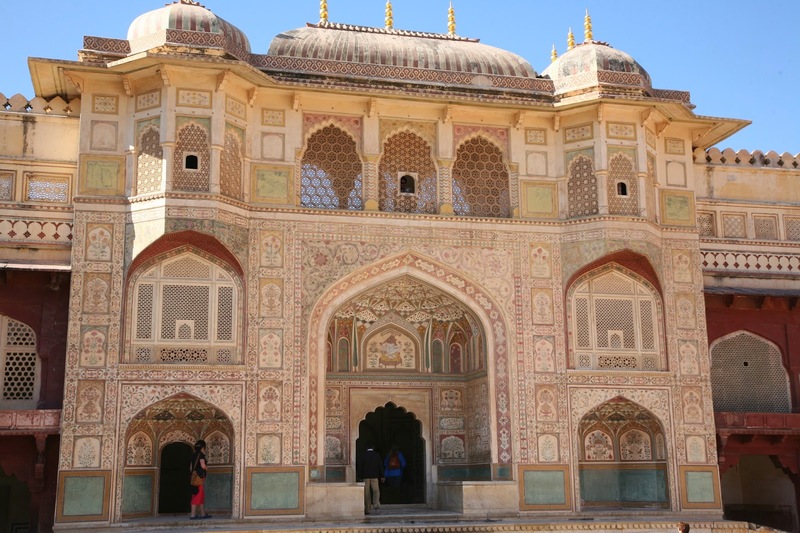 In Rajasthan you will find a variety fortified defensive structures which for centuries served the ruling Maharaja as a residence and seat of government. 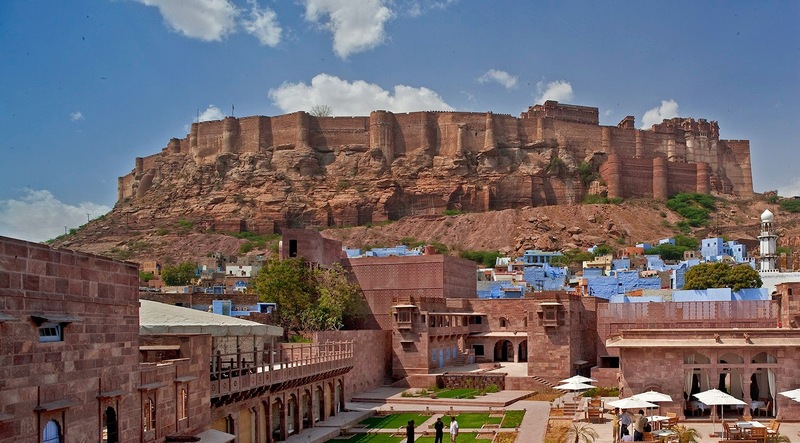 Among the most spectacular facilities include Amber Fort in Jaipur, the Red Fort in Agra and Mehrangarh Fort in Jodhpur. Splendid palaces are located behind the high walls of fortresses. Even today, can the wealth and prosperity of the ruling princes guess when entering the facilities. Defense structures such as Fort Mehrangarh still bear the traces of armed conflicts of earlier centuries. 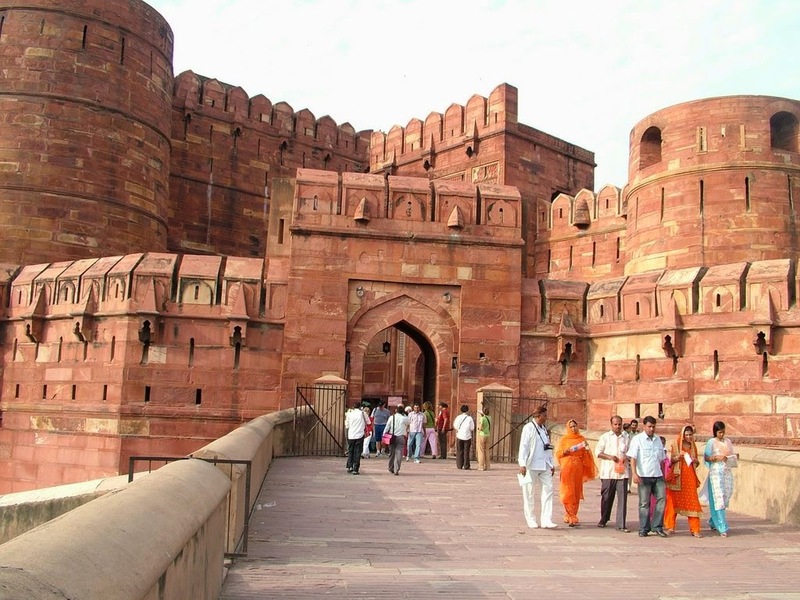 The Red Fort in Agra impressed by the reddish color of the protective walls. As building material came mainly red sandstone from Rajasthan used. 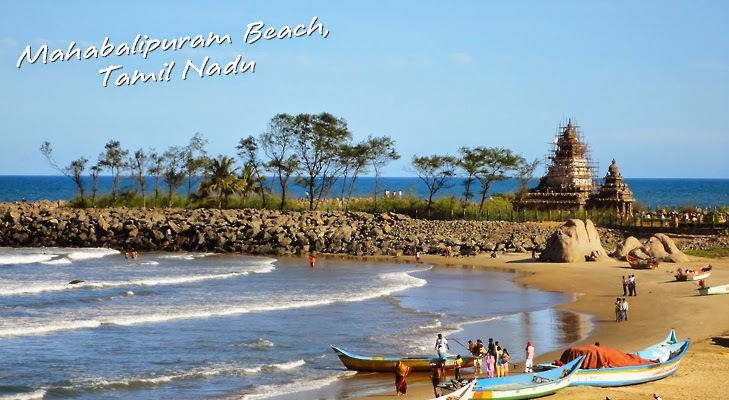 A mixture of beach holiday and cultural travel experience awaits you in the southern Indian town of Mahabalipuram. Fantastic sandy beaches attract in the region of the Coromandel coast along. At the same time located in the place the most important archaeological site in South India. Numerous temples dating from the 7th to 9th century were already exposed. Among the most famous attractions of India is one of the Palace of Winds. The building from 1799 is located in the city of Jaipur and has a striking honeycomb-like facade. 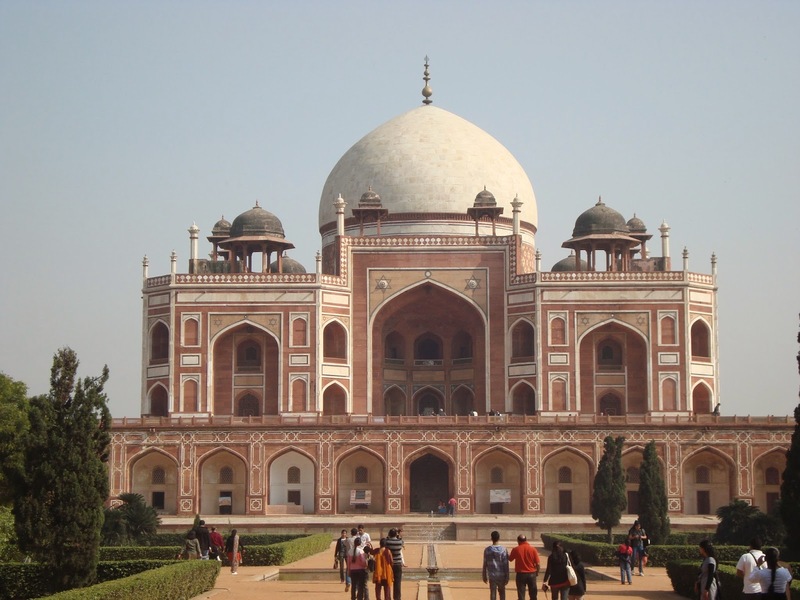 In Delhi, you have the opportunity to pay the tomb of the Mughal emperor Humayun a visit. The building was added to the World Heritage List of UNESCO in 1993. An architectural gem from the 13th century can be found with the Keshava temple in Somnathpur the Indian village near the city Mysore. Taj Mahal : The "crown of the place" The Taj Mahal is regarded worldwide as one of the most important buildings of the Indo-Islamic architecture and was recorded in 1983 in the list of "World Heritage Site". Udaipur : colorful and originally - The approximately half a million inhabitants city of Udaipur with its island palaces, lakes, splendid gardens and temples a tourist center of India. 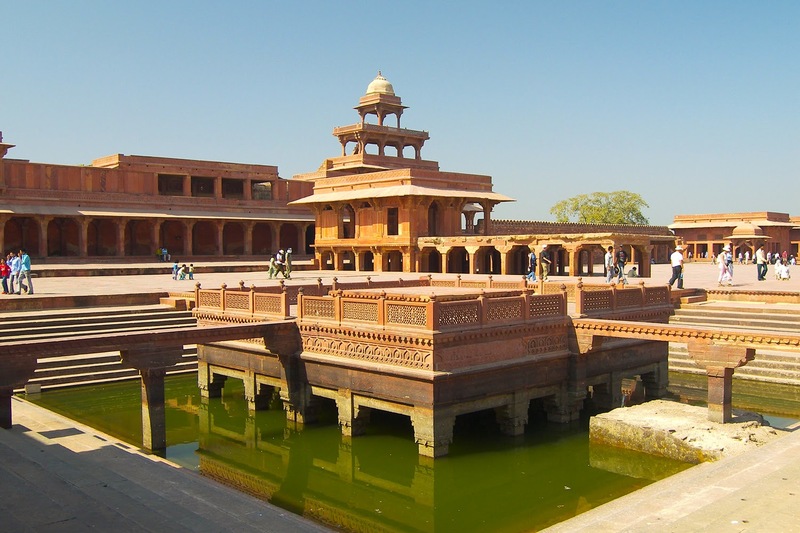 Fatehpur Sikri : Treasure of architectural monuments Fatehpur Sikri is the old capital of the former Mughal Empire and has a vast treasure of architectural monuments. Mahabalipuram : Beach and lively history The place Mahabalipuram belongs to the preferred destination for beach lovers and history buffs. In addition to beautiful sandy beaches you can see archaeological treasures. Fort Amber in Jaipur : mighty fortress With the Amber Fort an impressive fortress from the time of Mughal rule is halfway between Jaipur and Amber. 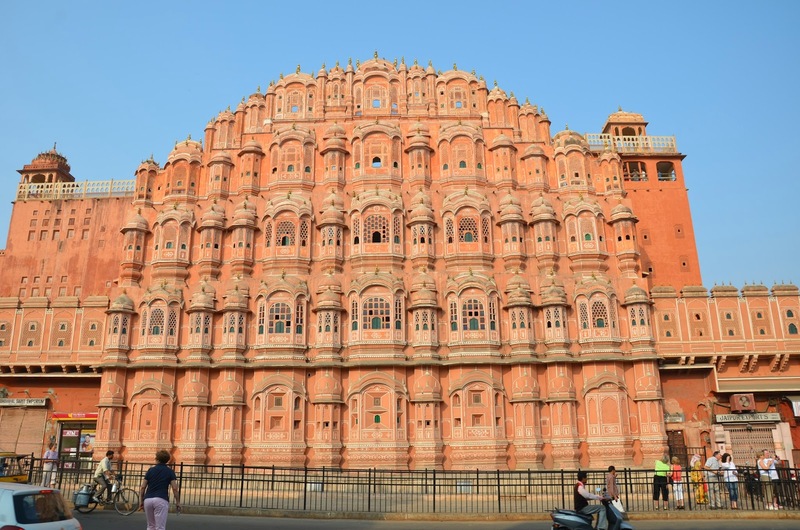 Palast der Winde : popular photo motif The Palace of Winds part with its unusual honeycomb facade of pink sandstone of the most photographed buildings in India. Rotes Fort in Agra : an impressive palace complex The Red Fort in Agra is a powerful fortress and palace complex, which is located near the world famous Taj Mahal and is a World Heritage Site by UNESCO. Grab des Humayun : cultural History The Humayun's Tomb in Delhi is the tomb of the Mughal emperor Muhammad Nasiruddin Humayun. The building is since 1993 a World Heritage Site by UNESCO. Meherangarh : impregnable system The massive fortress Meherangarh rises like a giant cuboid monolith on a more than 100-meter-high hill overlooking the city of Jodhpur. Somnathpur : Seat of the Keshava temple Somnathpur is a village located approximately 35 kilometers east of the major Indian city of Mysore. 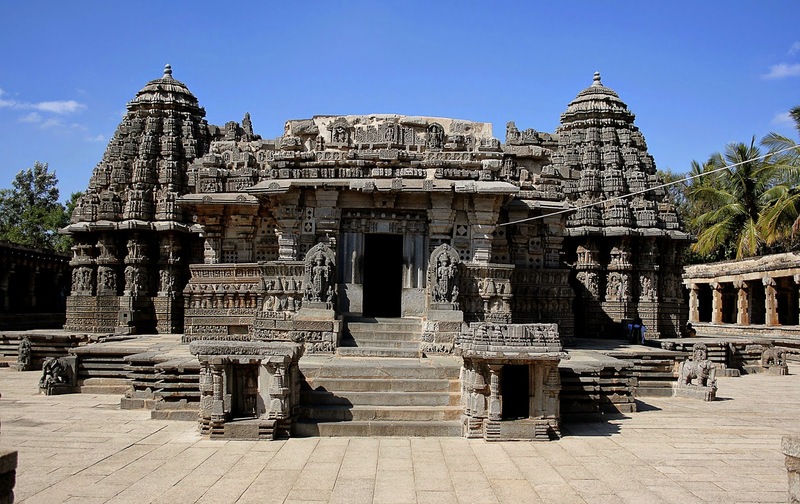 The Keshava temple from the 13th century is the main attraction of the place. 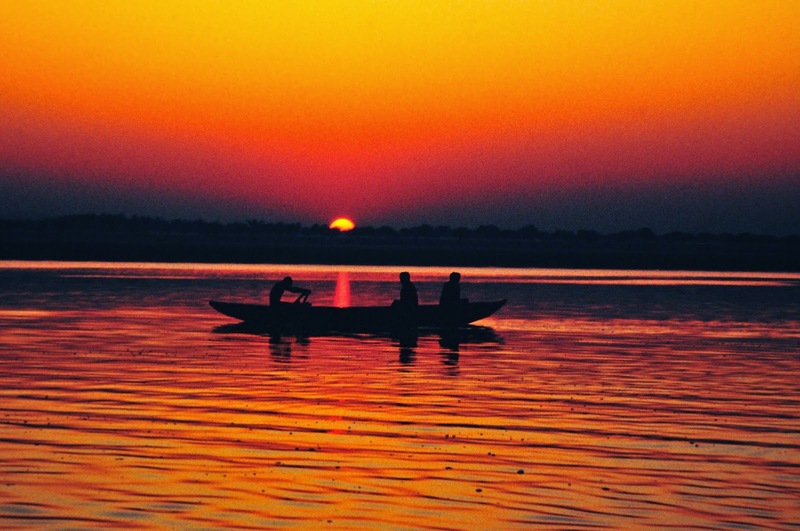 Sunrise on the river Ganga : Varanasi has something different to offer every time you visit it. 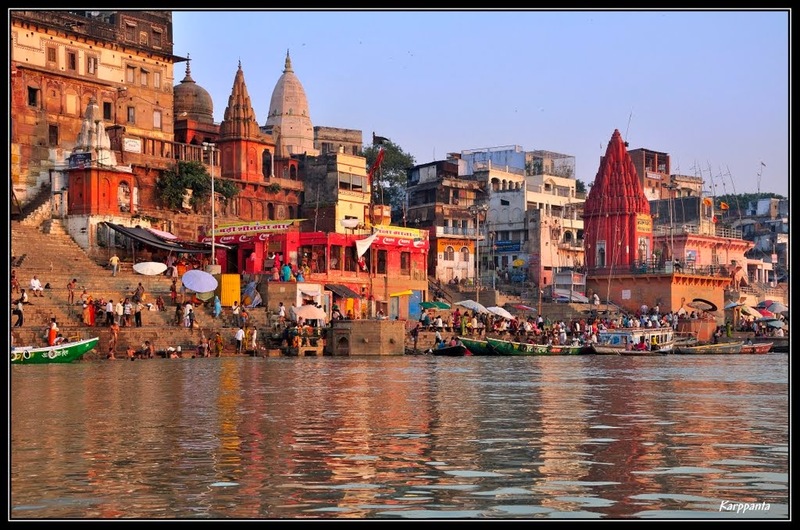 The calm waters of Ganga, boat ride in the beautiful sunrise, a range of shrines and the elevated banks of the ‘Ghats’ offer a spiritually enriching experience that is exclusive to this city. 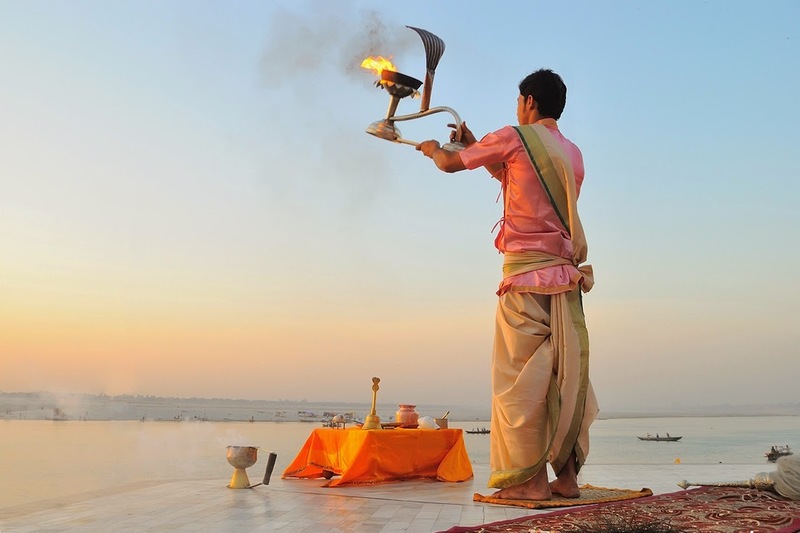 Morning ‘Aartis’(prayers) : Varanasi awakens to the soothing morning prayers at the holy river. Hordes of Pilgrims gather at the Ganga for ‘morning Aarti’ before the dawn when the sun rises on the horizon. 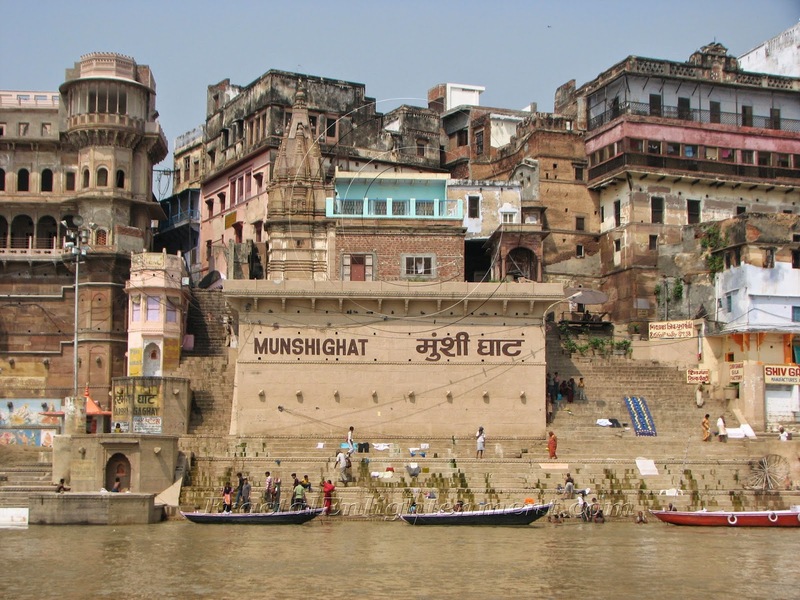 A look at the Ghats : The city of Varanasi is a haven for the pilgrims owing to its ancient Ghats. The enchanting sounds of temple bells, the fragrance of colorful flowers and the resonating chants greet the day here. 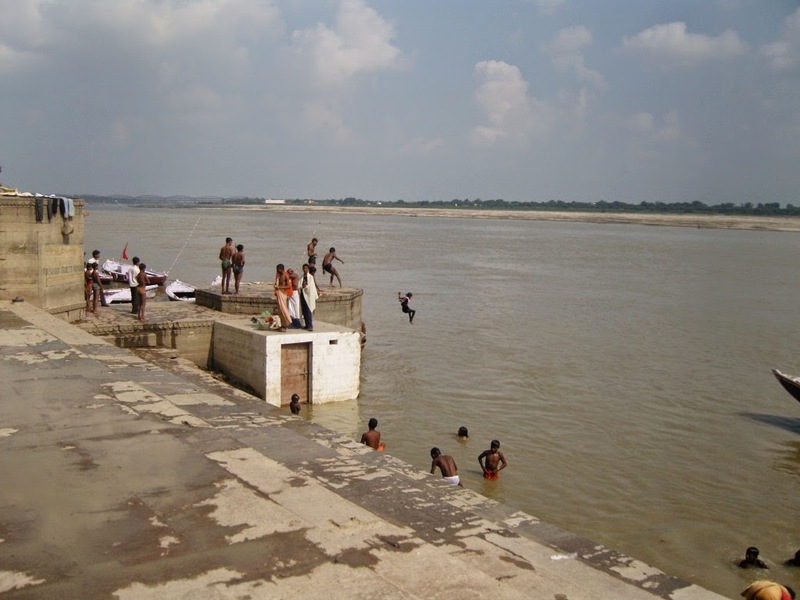 Chet Singh Ghat : This ghat is entrenched in its own history. It witnessed a furious battle between Chet Singh and Warren Hastings in 1781. Ahliya Ghat : The ghat is the first one to be named after a person. It got its name from Ahliya Baj Holkar-the warrior queen of Indore. 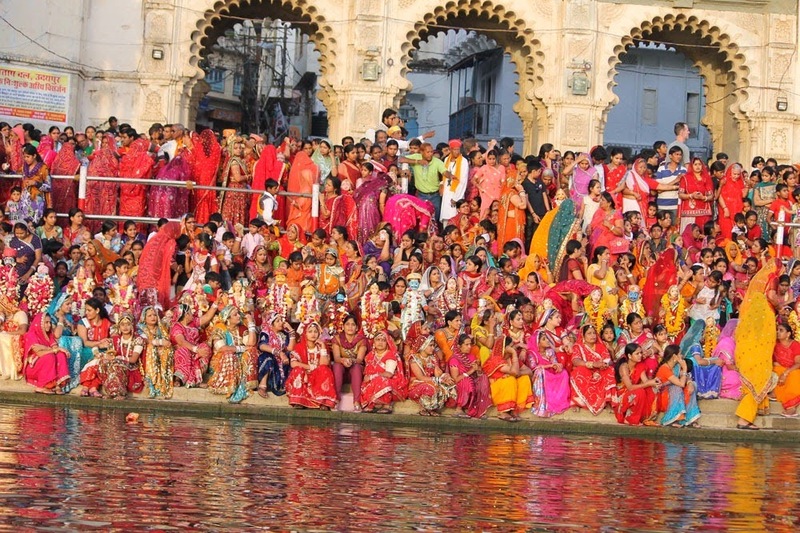 The ghat witnesses mornings with a swarm of tourists gathering to take a dip in the holy waters. Prayag Ghat : Brimmed with devotees that assemble to offer their prayers night and day, the ghat forms one of the crucial sections of the Varanasi Ghats. Munshi Ghat : Munshi Ghat is one of the most attractive and architecturally inspiring ghat. It is an extension of the well known ‘Darabhnaga Ghat’ and is bordered by a magnificent palace built by a royal family of Bihar in 1900s. Evening prayers at the Dashashwamedh Ghat : The Dashashwamedh Ghats livens up around dusk with the evening Aarti at the Ganga. Performed by priests or ‘Pundits’ clad in saffron, the evening Aarti is a detailed ceremony full of Puja, Fire and Dance. The bank of the river lights up with blazing lamps and the Ghat is scented with the smell of sandalwood. The movements of the lamps held in the hands of the Pundits are perfectly synchronized with the reverberations of the cymbals and the recurring chants. 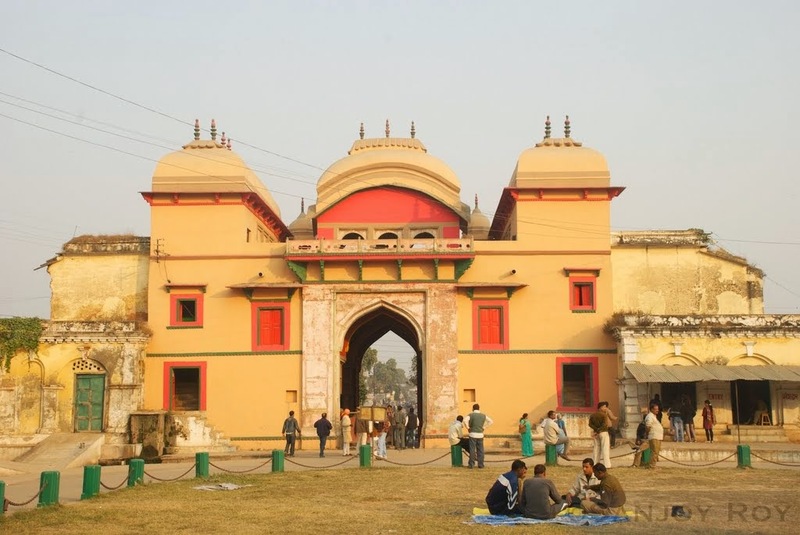 Sri Kashi Vishwanath Temple : It is one of the oldest temples and is at a little distance from Ganga. The temple also forms the beginning point of ‘Panchkoshi Yatra’- a sacred 88.5 kilometers long barefoot walk encompassing Kashi. 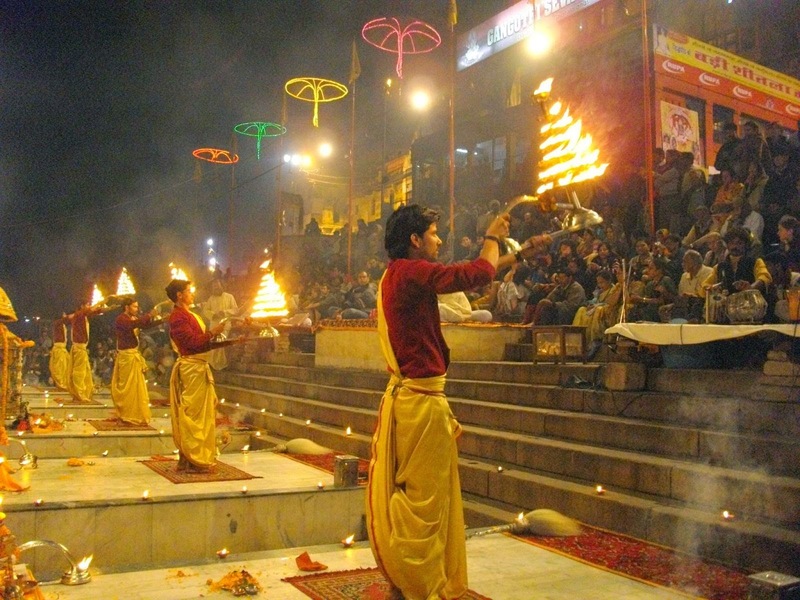 Varanasi Streets : Some say that the streets of Varanasi hold the charisma of the city. The streets are quite narrow and difficult for traffic to pass. Do not fear getting lost in them as sooner or later you will reach the main street or the front of the river. For collecting some souvenirs, visit the Vishwanath Temple or head to the tracks in the vicinity of the Ghats. Ramnagar Fort : This fort of the 17th century forms a wonderful place to view the sunset over the river. 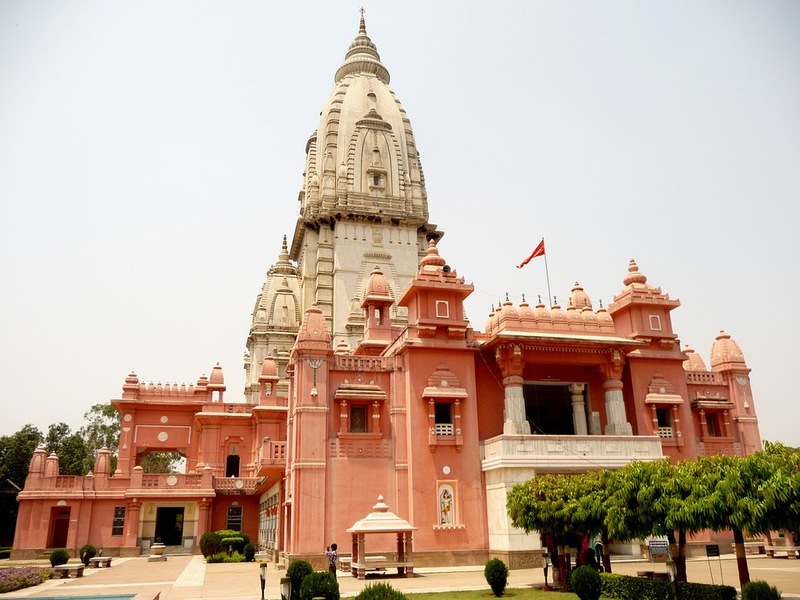 It nestles a museum and a temple inside its compound and was built by the ‘Maharajas of Banaras’. 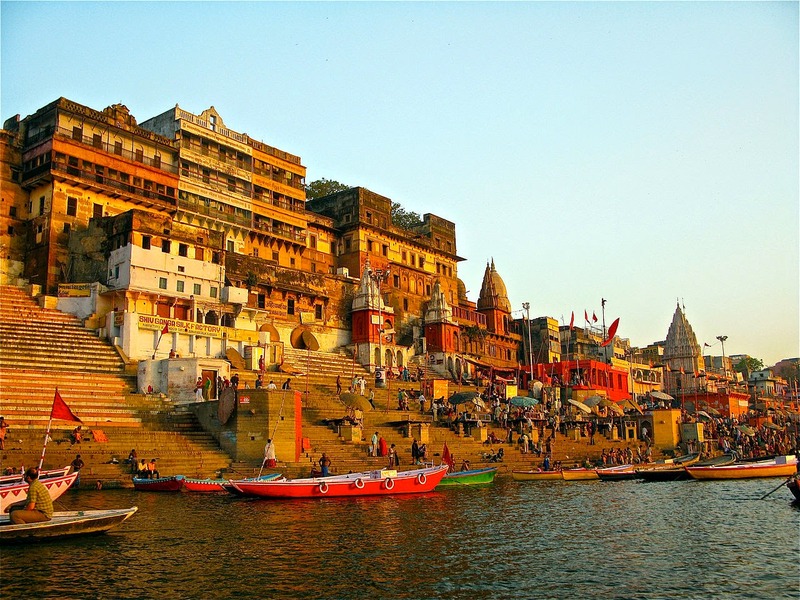 The holy city of Varanasi is packed with temples and pilgrims from across the world visit it to catch a glimpse of religion and faith. Book a cheap flight information with worldroom hotels and visit this city to get closer to religion and spirituality. The Incredible India is blessed with nature’s greenery and rivers. Tourists from all across the world, visit India for its serene environment, including attractive beaches, hill stations and magnificent waterfalls. There are so many waterfalls located in India, which are famous for their height and beauty. Waterfalls in India are mostly seen during the monsoon season. The splendor of the fall from a height adds roaring sounds in the site’s aura. Here we will discuss about the amazing waterfalls that have restored the scenic beauty of Indian nature. 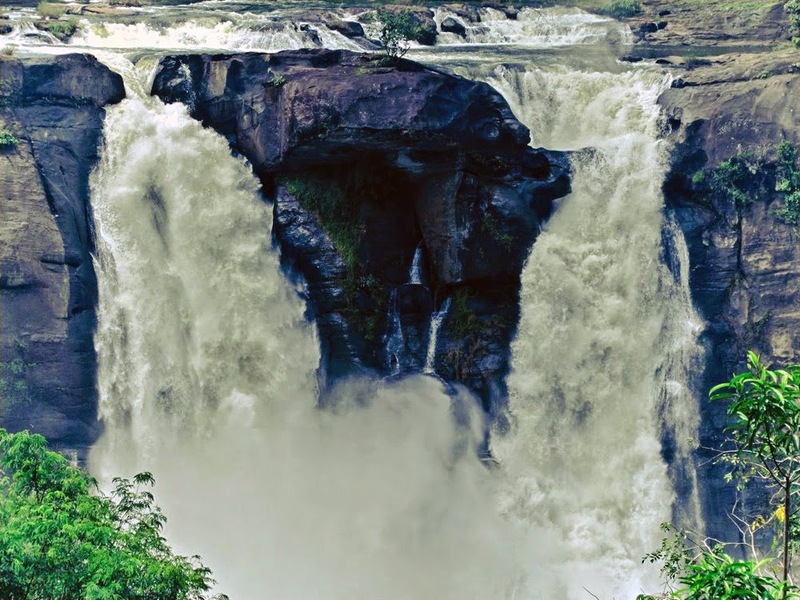 Athirappilly Falls: This nature’s spectacular fall is known as the Niagara Falls of India. Located in Kerala. Water flows from a height of 590 ft. One of the best waterfalls in India is a famous tourist attraction. Bharachukki Falls: Water falling from a height of 98 meters, this waterfall is formed by the river Kaveri. There is another waterfall known as Gaganachukki. These two falls split to form an island of Shivanasamudra, a small town. Near the base of the water fall, there are number of wells where visitors enjoy boat rides. 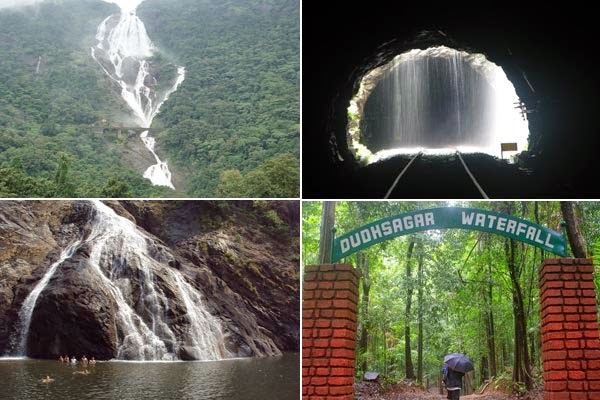 Dudhsagar Falls: Goa is not only famous for its beaches but also has this marvelous waterfall in store. Falling from a height of 1020 ft, the Dughsagar Falls intakes heavy flow of water which colors the flowing water white. Thus, this waterfall is also known as ‘Sea of Milk’. 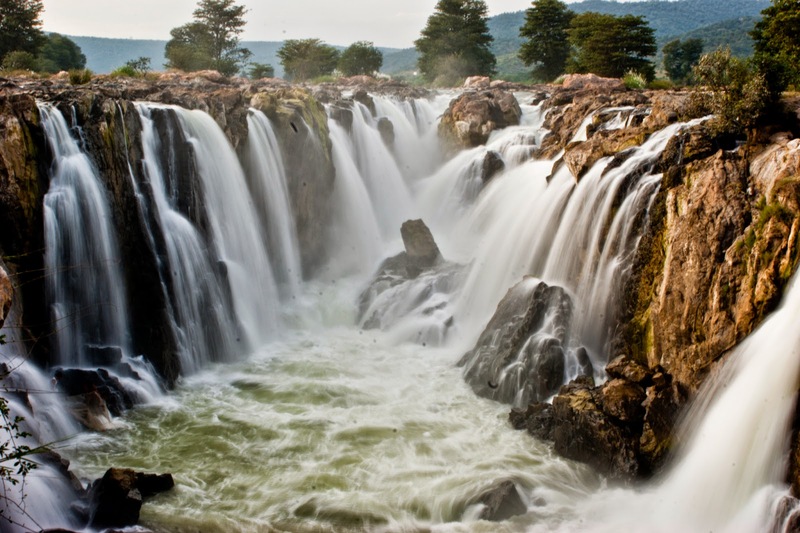 Hogenakkal Falls: River Kaveri holds a beautiful waterfall in Dharmapuri, South India. The name Hogenakkal came from two Kannada words, which together mean ‘smoking rocks. With the water falling from a height of 750 ft., a spray is created when the water crashes on rocks. It is a famous tourist destination that has many resorts nearby. A perfect scenic view can be enjoyed from here. 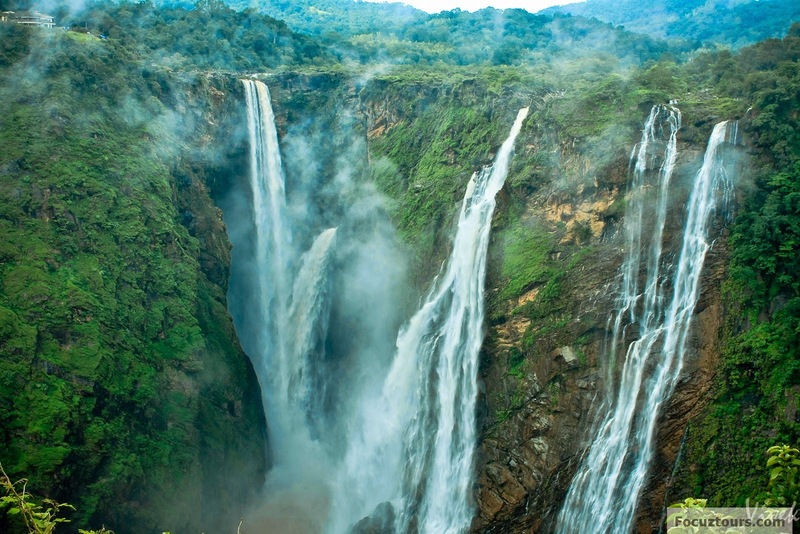 Jog Falls: One of the highest plunge falls in India, the Jog falls is formed from the Sharavathi River, Karnataka. Water falling from a height of 253 meters, the Jog fall consists of four cascades, namely Raja, Rani, Rover and Rocket. It is a not-to-miss waterfall in India. 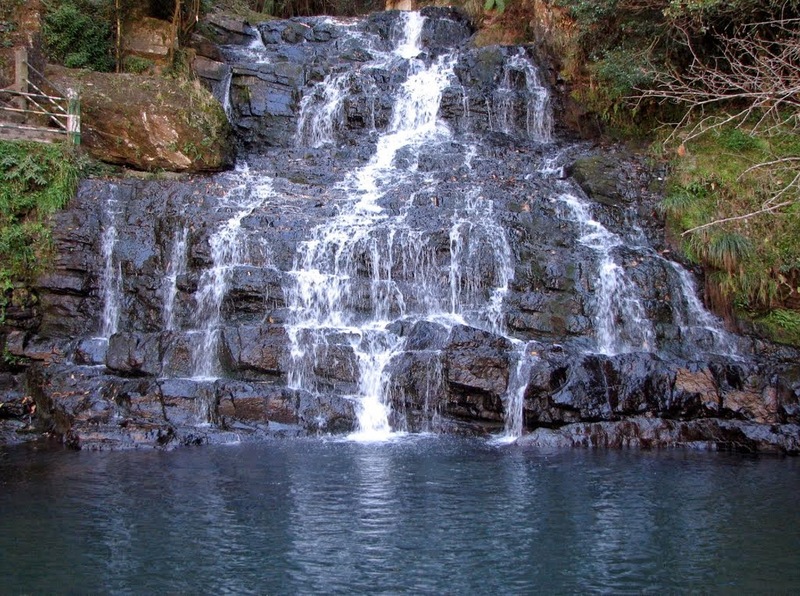 Elephant’s Falls: Resembling the region and scenic view of Scotland, the Elephant falls are located 12km from Shillong. Misty and foggy weather prevails in this region. Weather gets cold here, so this famous tourist spot has visitors carrying woolen clothing with them. The water fall delivers stunning appearance which is also depicted in some of the ancient paintings. If you have wander lust and constantly plan for your next trip, then obviously you have a trusted airline partner for your traveling experience. In case you are a nitpicker and prefer traveling in best airlines then here’s a list of world’s top notch airlines to travel with. 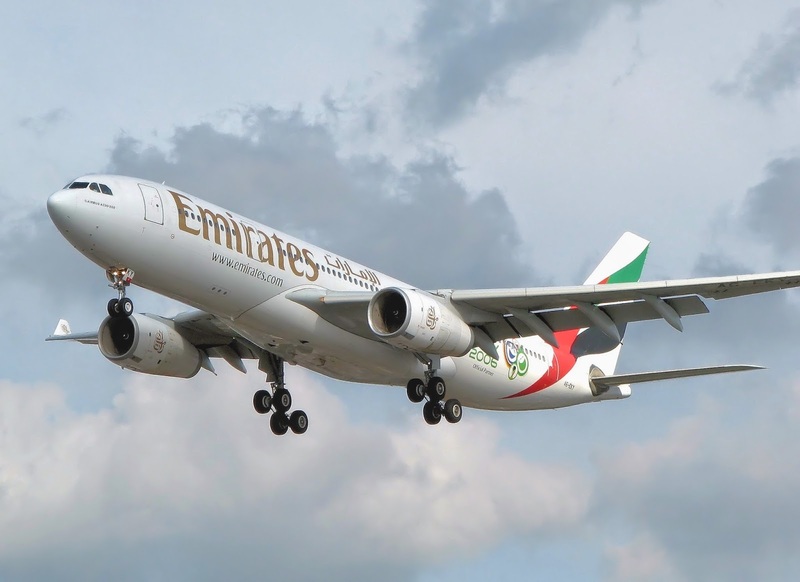 Emirates is a Dubai based airline and provides an exemplary service in cabin comfort, food and in-flight assistance. They have excellent customer service and provide First Class, Business Class and Economy Class Cabin. Emirates has bagged the World’s Best Airline Award-2013; a highly prestigious award presented by Skytrax. Qatar Airways had been awarded the famous Skytrax World’s Best Airline Award of the year 2011 and 2012. They make travelling by air much more relaxed and effortless as they give high-quality service. It serves 133 destinations worldwide, including Asia, Africa, North America, Europe, South America and Oceania from its pivot point, i.e. Doha International Airport, which makes it one of the few airlines capable to fly to all six populated continents. Singapore Airlines : Singapore Airlines Limited is the flag carrier of Singapore and a 5-star airline. Singapore Airlines began its journey back in 1947 as Malayan Airways, and since 66 years it has been serving 62 destinations in 35 countries across the globe. Their in-flight services include suites, first class, business class and economy class cabins, excellent entertainment choices and appetizing cuisines. With services worth enjoying, there’s nothing more you would ask! 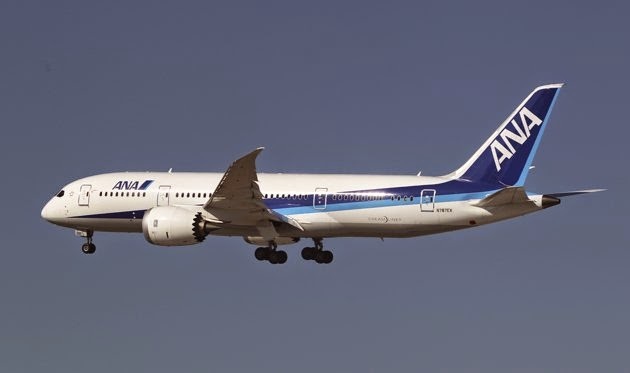 All Nippon Airways : ANA, is a Japanese airline. All Nippon Airways is a Japan based airline, founded in year 1952. It has been providing excellent in-flight services, and recently in 2009 they introduced fully-lie-flat-bed business class seats for business class and fixed shell back seats in both of its economy classes. They have a comprehensive domestic route circuit that serves entire japan, whereas their International route covers China, Korea, United States, Western Europe and Southeast Asia. 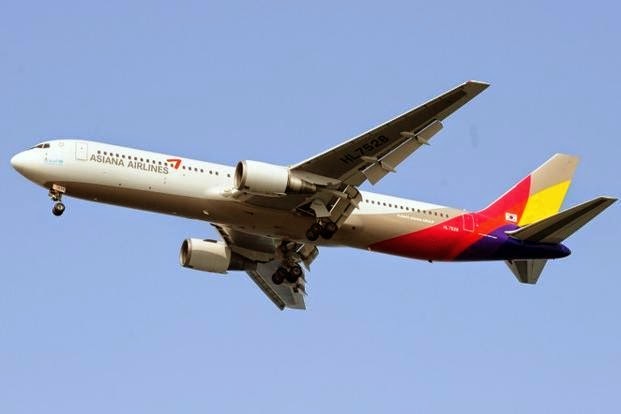 Asiana Airlines : It also the Best Airline in Asia title. Asiana Airlines is South Korea’s major airline apart from Korean Air. Founded in 1988, the airline serves both domestic and international travellers with Domestic hub in Gimpo International Airport and International hub at Incheon International Airport. It serves four continents with well rooted Asian network that covers all important cities in China, Japan, Central Asia, Southeast Asia, as well as North America and Europe. They provide special in-flight services, and have First suite class, First class, business class, and economy class cabins to suit your flying needs. 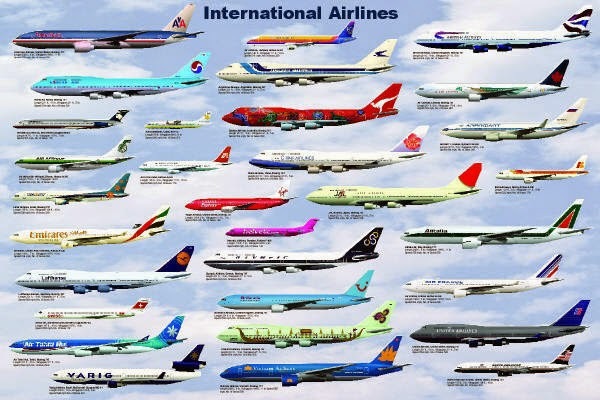 These airlines have been listed among the top airlines by Skytrax. So next time when you’re planning a trip, consider from these top 5 airlines to be your travailing partner! For many travelers, Singapore is a stopover, a shopping and recreation break between flights - but a home? Indeed, it draws many in the German Tiger State, whether as a student or expatriate. Of course it is good to prepare such an endeavor - ultimately it does not take all day near the equator, far away from family and friends. Singapore makes it to its visitors and citizens on time, however, relatively easy to settle and acclimatize. No wonder: has always been the Lion City target of countless immigrants, a melting pot of nations. Who soon enough with his relocation to Singapore deals and shop around for a suitable accommodation, not even have to pay the dreaded high rents. Unless, of course, something other than a city villa with pool is not in question. Who is interested in a property in Singapore - whether as an investment, as a commercial property or to occupy yourself - has to adjust expected to find a very mixed market where the prices change almost unpredictable and erratic. What investors may be an interesting field - despite continuing building boom there a housing shortage - the worse for the people who buy real estate or just want to rent. Depending on the residential location of this project can be very costly? Naturally, the preferred residential locations on the water, so there you have to expect the highest rents or purchase prices. The most expensive paving the city's area is around the Marina Bay. Despite the sometimes quite high prices Singapore ranks no means the most expensive cities in the world. On the contrary, you can also stay relatively cheap - but then it has to compromise on comfort and location make. In general, the spectrum of the property is very broad, ranging from absolute luxury homes Thomson Three, LIV on Wilkie, with pools & Co. to very small units in residential high-rises. 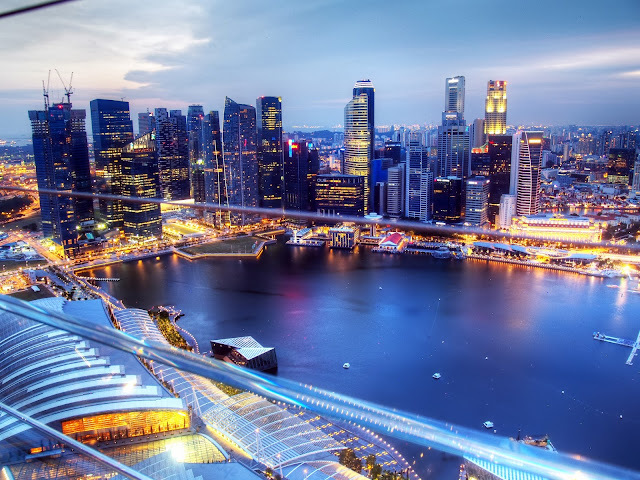 Foreigners may acquire real estate in Singapore in general, but it should bring a lot of time because the necessary administrative procedures can be very time consuming and tedious, etc. - unless of course you have good contacts with the relevant partners. In recent years, more and more agencies have been established, which specializes in the brokerage of real estate (newlaunch101.com) to foreigners and their care or hire - at an appropriate price, of course. By the way: who is posted as an expat in Singapore, gets in most cases accommodation provided - depending on the rank that can sometimes even be a pretty cottage in the middle of the city, including domestic workers and pool.